I’ve been wanting to sample a Sprinkles cupcake ever since I moved into town, but never found myself in the neighborhood. Believe it or not, I don’t have any business to conduct in Beverly Hills—shocking, I know. 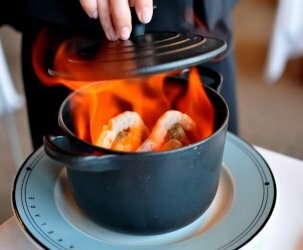 One Saturday not too long ago, I finally had reason to hit up Brandon and Brenda’s old ‘hood—dinner at The Bazaar by José Andrés. Since I don’t find myself in Beverly Hills very often, I decided to make a day of it. 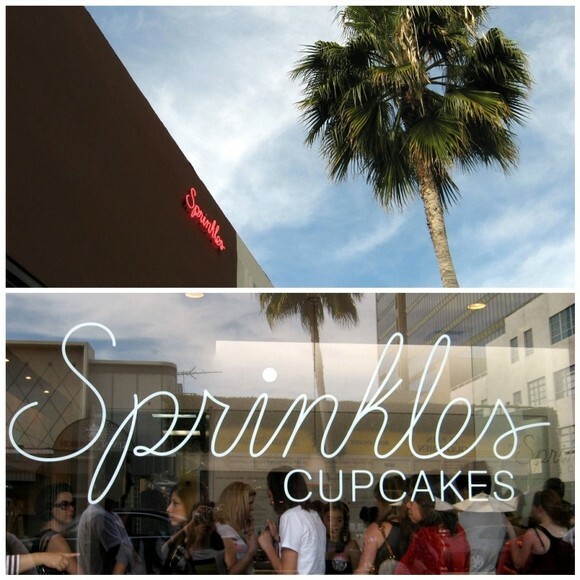 The Astronomer and I kicked off our 90210 adventure with his and hers Botox injections, then we headed to Rodeo Drive and nearby Kitson to shop for our new spring wardrobes; lastly, we swung by Sprinkles Cupcakes for a pre-dinner snack. As we approached the famed sweets shop, The Astronomer and I were greeted by a lengthy line of enthusiastic cupcake fans. Any fear that I previously expressed about the cupcake trend coming to a halt completely vanished at this moment. I must admit that I felt like a tool standing in a thirty-minute line for a measly cupcake. To add insult to injury, the man in front of me was sporting acid-washed True Religion jeans and carrying a small dog. As soon as we purchased the goods—a Cinnamon Sugar ($3.25) and a Vanilla Milk Chocolate ($3.25)—we quickly fled the trendy-meister scene. The Astronomer and I escaped to a peaceful park to enjoy our sweets. The Astronomer ordered the Cinnamon Sugar cupcake. 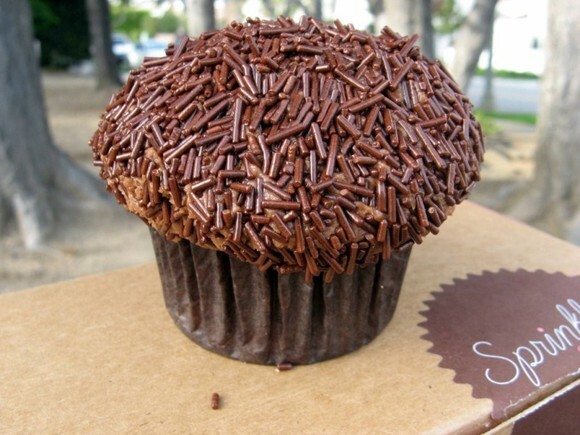 The Sprinkles employee made doubly sure that The Astronomer was aware that the cupcake did not contain any frosting before filling his order. Ha! The lightly spiced buttermilk cupcake came dusted with cinnamon and sugar. Unlike yours truly, The Astronomer prefers his sweets on the mild side, so this one suited him perfectly. I stole a few bites of the colorful sugar discs that topped the cupcake, but they didn’t taste as good as they looked. The actual cake, on the other hand, tasted outstandingly fresh with clean and delicious flavors. Winner! I ordered the Vanilla Milk Chocolate cupcake, which consisted of a Madagascar bourbon vanilla cake frosted with fudgy milk chocolate cream cheese and adorned with rich chocolate sprinkles from France. 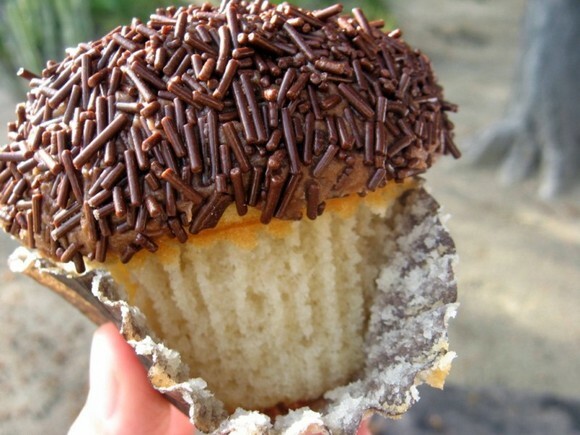 There sure are a lot of “food miles” on this cupcake. After hearing and reading so much hype surrounding Sprinkles Cupcakes, I arrived with sky-high expectations. The Vanilla Milk Chocolate cupcake met and exceeded my expectations—I was sighing and swooning with every bite. The cupcake’s texture was ideal—not too dense and not too insubstantially fluffy. The frosting was just sweet enough with the cream cheese accenting the chocolate flavors. The sprinkles were awesome and bursted with chocolaty goodness. The ratio of cake to frosting to sprinkles was perfect. I am officially on board the Sprinkles bandwagon. Who loves Sprinkles? We do. um. 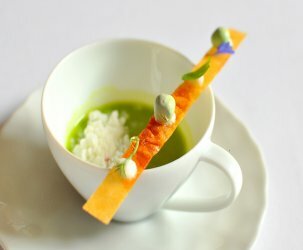 those look AMAZING. you must now try ALL of the cupcake places in our lovely area. at crumbs bake shop, the devil dog cupcake is just incredible. I have always wanted to try a sprinkles cupcake! Frankly magnolia’s cupcakes don’t stack up to Georgetown cupcakes in DC. I’d love to compare sprinkles witht he bunch. Those cupcakes look amazing. 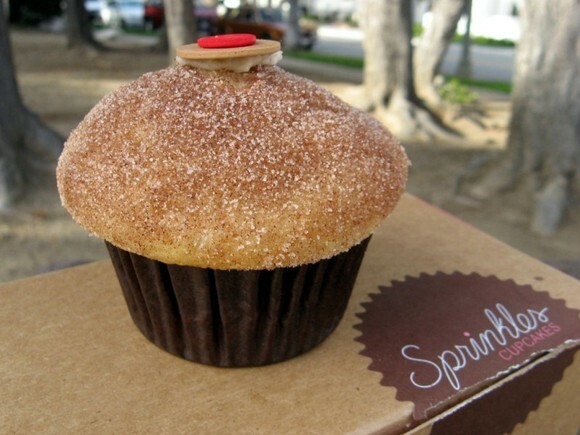 Could you Fedex me a cinnamon sugar cupcake? That would be awesome. I thought your references to trendy 90210 were hilarious…especially the throwback to Brandon and Brenda. Tell me you hit Nat’s and I’ll be impressed. G’ma – Crumbs, which is located a few stores down from Sprinkles, was a ghost town on the Saturday we visited. Totally deserted. But if the place is G’ma approved, I will give it a try. G’ma knows baked goods. 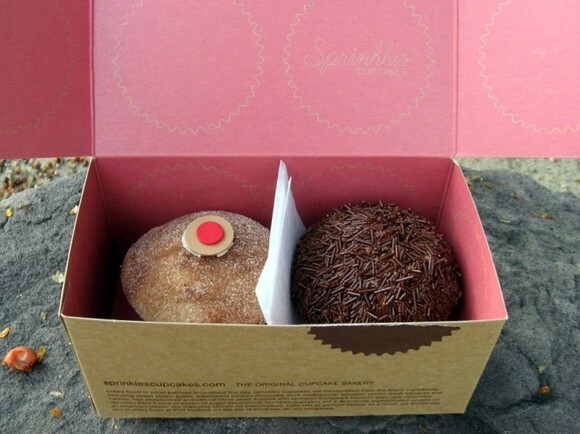 Ariel – Let’s hit up the Sprinkles at the Stanford Mall this Friday! YAY you finally got to make a trip! 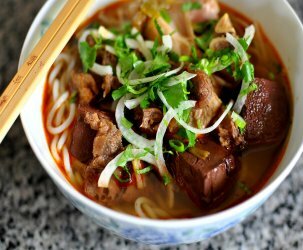 Totally yummy! Also did you just get engaged?? Congratulations! give me one of those and a cup of hot coffee in the morning at work. true. it was probably a ghost town for a reason. who could compete with sprinkles? but you should definitely try the competition for the ultimate cupcake showdown! After reading a bunch of snotty reviews of cupcake places (“the cupcake? Dry and flavorless…blah blah blah”) it’s nice to see someone enthusiastically enjoy it. Honestly – who could hate a cupcake? And color me impressed that the Astronomer enjoys his cupcakes sans icing. I could never, ever, ever be like that. Ever. In fact, icing by itself sounds pretty good. I have been wanting to try Sprinkles! This positive review just makes me want to try it even more. It is definitely on my list next time I take a road trip to LA. 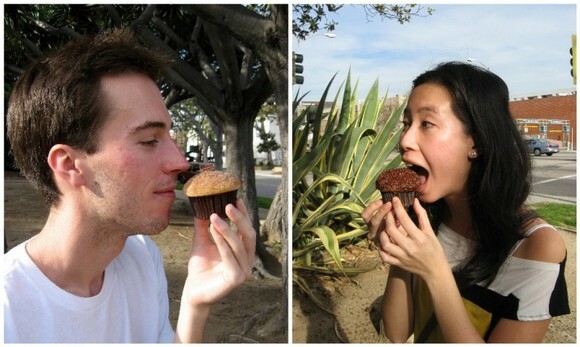 Hien – Those cupcakes would provide enough fuel to last you until dinner time. g’ma – I’ll swing by Crumbs the next time I go in for Botox touch ups. Fiona – “Who could hate a cupcake” — you’re so right! Even mediocre cupcakes provide a pretty pleasant sugar rush. Btw, Sprinkles offers frosting shots for frosting lovers like you. Kirbie – There’s a location in the O.C. if that’s more convenient coming from S.D. Wait – I don’t see a ring on that finger! Are you like my colleague, who says “I only want the *real* ring” and has no engagement ring? Tell all. Does he know you get Botox? Fiona – We weren’t engaged yet when we hit up Sprinkles. Look out for some mad bling in future posts 😉 The Astronomer gets Botox touch-ups too. HMMMMM !!!! They look so yummy. I love Sprinkles cupcakes too! The Sprinkles in Arizona never has a line, which is weird compared to the long line in Beverly Hills! 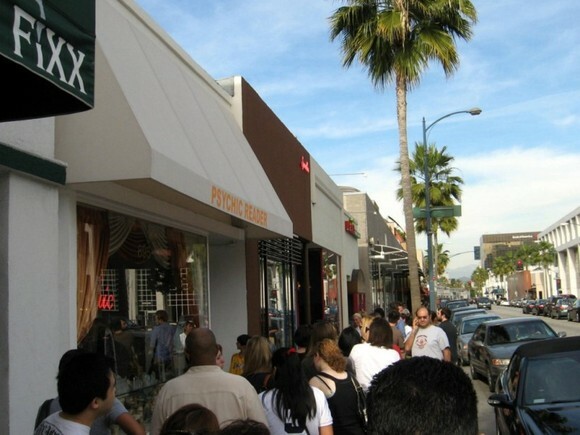 Do you think that Crumbs was deserted because Sprinkles is more trendy and everyone wants to go get cupcakes from the “it” place?